Divide By One: it didn't quite kill us, so i guess we're... stronger? it didn't quite kill us, so i guess we're... stronger? YES, we have finished the Great Divide journey! YES, we have a big game of media catch-up to play! NO, I am not recovered! 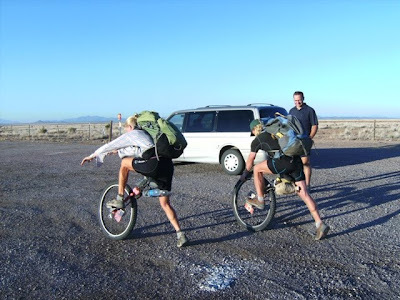 Early on in the adventure, it became clear to me that riding the Great Divide Mountain Bike Route on a unicycle would not be a test of technical riding ability; it is a test of will. It tests one's ability to endure: fatigue, extreme weather, dehydration, pain, etc. How to summarize the unsummarizeable? First I'll post (too?) many pictures from our journey south of Grants, NM. Then the really fun stuff starts, in the form of trip statistics and the like. Due to the continuing monsoon rains that create impassable roads, we had to take the Adventure Cycling-recommended alternate through the El Malpais National Monument, which actually ended up being way cool. The monsoons came a bewildering few weeks late this year, which unfortunately coincided with our travels through the really mucky section of New Mexico. Sidenote: I know I've mentioned the insects and animals frequently during the journey, but seriously, sometimes they are out of control. Dung beetles are simply outrageous, expending an astounding amount of energy forming balls of poop in the cow pies, then rolling them away to do what they do best (and I still haven't figured out what that is). The ant hills are tremendous, and if you camp anywhere within a expanse littered with them, they will crawl on everything - and I mean everything - and even into your sleeping bag. And oh, the mice - clever ones, they are, creating all sorts of ruckus while we try to sleep. The dogs mostly stay away when we draw our knives and pick up stones in a ready-to-throw posture. *Note: the total route miles listed is less than the initially intended 2,705 due to re-routes around impassable roads. 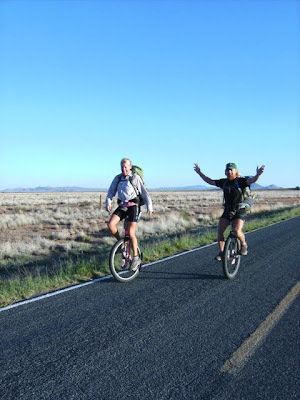 Miles actually ridden are ~6% more (on our 29-inch, single-speed unicycles) due to the natural squiggle during the turn of a unicycle wheel, making the total ridden mileage 2,786.4 miles. So, with little (if any) optimism from anyone who had actually ridden the route, we beat the odds and further expanded the horizon of possibility. Back in the real world, I am savoring every bit of music I can get in my ears; such a remote trip created quite a deprivation of one of my basic needs, as evidenced by frequent singing during the journey. Songs stuck in my head represented genres including, but not limited to, rap, children's songs, Gracie & Matt originals, and orchestral soundtrack scores to movies such as Dances With Wolves and Mr. Holland's Opus. Finally I am going to post two lists of things I will and will not miss about the journey. Lest I bore you with more, so ends the journey. Thank you so much to all those who helped and supported us in person or remotely - seriously, we are so very thankful! Thanks to Panama Jack, KEEN Footwear, roll: bike shops, and Kris Holm Unicycles: Evolution of Balance, who made it all possible. Good luck to our friends hiking the Continental Divide Trail, finishing up the home stretch! Congrats both of you! I hope you enjoyed some cold cervezas y tacos de pescado whilst you visited nuestros neighboros. Hurray!Congratulations!! Can't wait to see you. We! are! proud of YOU!!! Hey!!! We are proud of YOU!!! Someday children will be told of your adventure and the kids will think they're being told a whopr. Unbelievable feat. Thankfully over! Now enjoy the ice cream. You earned it. We love you and are glad you're back. It's been great following your ride. Congratulations on finishing the most epic muni adventure of all time! Congratulations Gracie and Matt , You have done something that just boggles the mind . The drive and inspiration that you both have showed in your blogs have been entertaining and inspirational . Gracie, what's up with those untucked shoelaces, girl? You should know better. Maybe just too used to riding barefoot, no laces to tuck. Wish my mom could see me now! Standing five foot nine on the starboard bow! A great adventure and a great story. It was a privilege to get to spend some time with Matt and you at the festival this weekend; congratulations on an incredible accomplishment! I've been following your journey from day 1 and I must say that you and Matt are pretty incredible. I'm filled with jealousy at the adventure you two had but it fuels my desire to get out there and do something that pushes and stretches what I thought possible. so congratulations you deserve all the ice cream and soda you can stomach...and thanks for a wild ride. Well done, good and faithful unicycler. What an amazing story. A friend of mine who graduated from Duke 20 years ago sent me the article about your journey. Last month, I married an 11-year leukemia survivor. He celebrated the 10-year anniversary of his bone marrow transplant by training for and completing the Lake Placid Ironman. We are both very involved with the LLS in Washington, DC. Thank you for all you did to raise awareness and funds for the LLS. Hope you are relaxing now! Those three flat tires you got in one day are most likely from a wonderful little piece of New Mexico flora known as a "goat head." Nasty little buggers. Bad for bike tires, bad for dog paws, really bad for bare feet. Just want to say that you guys are awesome! Ran across your blog researching the trail. Super cool!! Way to go! Hi I met you guyz in Montana in White Fish. I was doing the divide on a bicycle and I was with some Kiwis. We rode briefly together for a few miles. Just wanted to say AWESOME two years late. Loved your miss / won't miss list. Almost exactly like mine. You guyz rocked and probably still do.